Today, January first, in the Orthodox Church, we celebrate a double feast. Being the eighth day of Christmas, that is the eighth day after Christ's birth, Jesus was named and circumcised according to the Law of Moses. For our salvation, God became fully human, and subjected himself to all that entails. As a human, he received a name, Jesus, which means "Savior." As God, he gave the Jews the Law, and as a man, he shows us how to faithfully follow his commandments. Being born a Jew, he followed the Law; as the Messiah, he fulfilled the Law. Circumcision was the initiation rite into Judaism; Christ fulfilled it and gave us Holy Baptism for us to be initiated into our life in Christ. Under the Law, only men were circumcised; in Christ all can be baptized equally, as their is "no male or female." Just as the Jews circumcised infants born to Jewish parents, bringing them into the Jewish faith, so traditional Christians baptize their infant children to bring them into faith and discipleship at a young age so they can follow Christ their entire life. The second commemoration on January first is Saint Basil the Great. 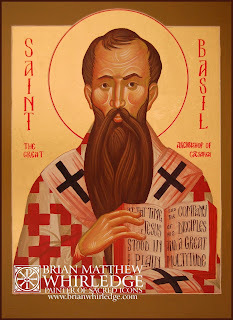 Saint Basil was a great bishop, liturgist, teacher, ascetic, and theologian. Saint Basil came from a family of saints. He was born (330) to godly parents, whose parents suffered persecution and martyrdom under Emperor Diocletian. His mother, Saint Emilia and his father, Basil, had ten children, five of whom are formally canonized saints. Saint Basil the Great, acrylic and gold leaf on panel, 11x15" private commission. He studied philosophy and rhetoric in Athens, becoming friends with St. Gregory the Theologian. He undertook an ascetic pilgrimage to Syria, Palestine, and Egypt. Inspired by the holy monks, he returned to Cappadocia, lived a very austere life, founded a monastery, and was ordained a priest. Any part of the Scriptures you like to choose is inspired by God. The Holy Spirit composed the Scriptures so that in them, as in a pharmacy open to all souls, we might each of us be able to find the medicine suited to our own particular illness.Thus, the teaching of the Prophets is one thing, and that of the Historical books is another. And, again, the Law has one meaning, and the advice we read in the Book of Proverbs has a different one.But the Book of Psalms contains everything useful that the others have. It predicts the future, it recalls the past, it gives directions for living, it suggests the right behavior to adopt. It is, in short, a jewel case in which have been collected all the valid teachings in such a way that individuals find remedies just right for their cases.It heals the old wounds of the soul and gives relief to recent ones. It cures the illnesses and preserves the health of the soul.Every Psalm brings peace, soothes the internal conflicts, calms the rough waves of evil thoughts, dissolves anger, corrects and moderates profligacy.Every Psalm preserves friendship and reconciles those who are separated. Who could actually regard as an enemy the person beside whom they have raised a song to the one God?Every Psalm anticipates the anguish of the night and gives rest after the efforts of the day. It is safety for babes, beauty for the young, comfort for the aged, adornment for women.Every Psalm is the voice of the Church. Thanks for this quote from the great saint! I heard it twice tonight on Ancient Faith Radio. The place of the Psalms in the center of the Bible surely is no accident! May I keep them so in my heart throughout the day and night.